Vatican City, May 13, 2008 / 01:59 pm (CNA).- The Director of the Vatican’s Observatory, Fr. José Gabriel Funes, said in an interview with the Vatican daily, L’Osservatore Romano, that believing in the possible existence of extraterrestrial life is not opposed to Catholic doctrine. The 45-year-old Argentinean priest heads the Vatican Observatory, founded by Pope Leo XIII with offices at Castelgandolfo, near the Apostolic summer palace, and another in Tucson, Arizona. Fr. 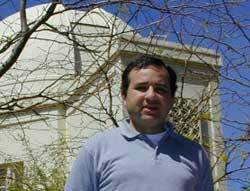 Funes has been in charge of the Observatory since August 2006. The astronomer began the interview titled, “The Alien is my Brother,” by saying that, “Astronomy has a profound human value. It is a science that opens the heart and the mind. It helps us to put our lives, our hopes, our problems in the right perspective. In this regard, and here I speak as a priest and a Jesuit, it is an apostolic instrument that can bring us closer to God”, said Fr. Funes in the interview. “But if they were sinners?” L’Osservatore’s journalist asks.